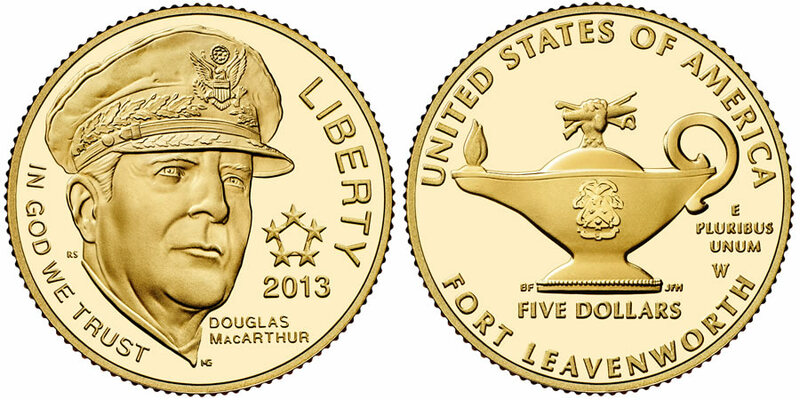 The 2013 5-Star Generals Commemorative $5 Gold Coin features an obverse portrait of 5-Star General Douglas MacArthur. This strike is offered by the United States Mint as one of three different releases to appear as part of the 5-Star Generals Commemorative Coin Program. Each of the $5 gold coins is struck to the standard specifications of a modern commemorative. This includes a composition of 90% gold and a diameter of 0.850 inches. According to the terms of the legislation which authorized the program (5-Star Generals Commemorative Coin Act (Public Law 111-262)), coins of this series are struck "in recognition of five United States Army 5-Star Generals, George Marshall, Douglas MacArthur, Dwight Eisenhower, Henry ‘‘Hap’’ Arnold, and Omar Bradley, alumni of the United States Army Command and General Staff College (CGSC), Fort Leavenworth, Kansas, to coincide with the celebration of the 132nd Anniversary of the founding of the United States Army Command and General Staff College." Surcharges will collected on the sale of each $5 gold coin in the amount of $35. Funds raised by the surcharge will be forwarded to the CGSC Foundation to help finance its support of the college. Shown on the obverse of the 5-Star Generals Commemorative $5 Gold Coin is a portrait of 5-Star General Douglas MacArthur. The portrait was designed by United States Mint Artistic Infusion Program (AIP) Associate Designer Ronald D. Sanders with United States Mint Sculptor-Engraver Michael Gaudiso in charge of its execution. Obverse inscriptions include IN GOD WE TRUST, DOUGLAS MACARTHUR, 2013 and LIBERTY. On the reverse of the coin, a depiction of the Leavenworth Lamp is offered. The lamp is seen as a symbol of the Command and General Staff College. Reverse inscriptions include UNITED STATES OF AMERICA, E PLURIBUS UNUM, FIVE DOLLARS and FORT LEAVENWORTH. The reverse was designed by AIP Master Designer Barbara Fox with sculpting to be completed by United States Mint Sculptor-Engraver Joseph Menna.